The popcorn oil you choose is one of the key factors in determining the taste of your popcorn. For years movie theaters have used coconut oil. 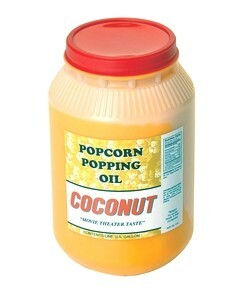 Coconut Oil is thought to be the best tasting oil to use when making great tasting popcron. When you think of "movie theater popcorn" this is most likely the taste that you have in mind. Canola Oil is a balance of great taste while also being considered one of the healthiest oil to use to make popcorn. Canola oil still provides a declious tastes but has both lower fat and lower cholesterol compared to most other types of oil. Since the oil the popcorn is cooked with is one of the largest factors in the taste of popcorn, we urge you to try different types and pick the flavor that's right for you!